The solution is simple to Restore Windows-8.1, 8 (and 10) Files and Folders when the file is stored in shell:RecycleBinFolder! And select the files and / or folders use right click and select restore! That's it! ... repair or recovery Windows 8 and 8.1 with Windows 8 (8.1) Installations DVD! ... show Control Panel, My Computer, Recycle on Windows 8.1! ... Create a password reset eg. recovery disk for Windows 8.1 and 8! When you delete a file, it's usually moved to the Recycle Bin so that you can restore the file later if necessary. To permanently remove files from your computer and reclaim any hard disk space they were using, you need to delete the files from the Recycle Bin. You can delete individual files from the Recycle Bin or empty the entire Recycle Bin at once. Tip: ► Blank And Secure - a Portable tool to securely delete the data! Windows-8 - FAQ-155: How To Restore Windows-8.1 / 10 Files and Folders? Windows 8.1 update RESTORE file? Delegated folders in windows 8.1 registry? How to restore the files which are deleted from recycle bin window 8 shortcut? How to restore files windows 8.1? Restore documents photos directory windows 8.1 registry? Run command to recover the deleted file in win 8.1? How to recover your permanently deleted file without any software in windows 8.1? Windows 8.1 Restore Files or recover deleted files on windows 8.1? Reset folders in windows 8? Restore files and folder settings windows 8.1? How to restore documents folder in windows 8,1? Temporary internet files restore folder location windows 8.1? How to restore files from recycle bin on windows 8.1? Restoring files from windows 7 to windows 8.1? Window8.1 recover permanently deleted folder without software? How to retrieve deleted files using command prompt win 8.1? How to restore all file an folders in win 8.1? Restore my files in windows 8.1? Restore windows 8.1 system folders? 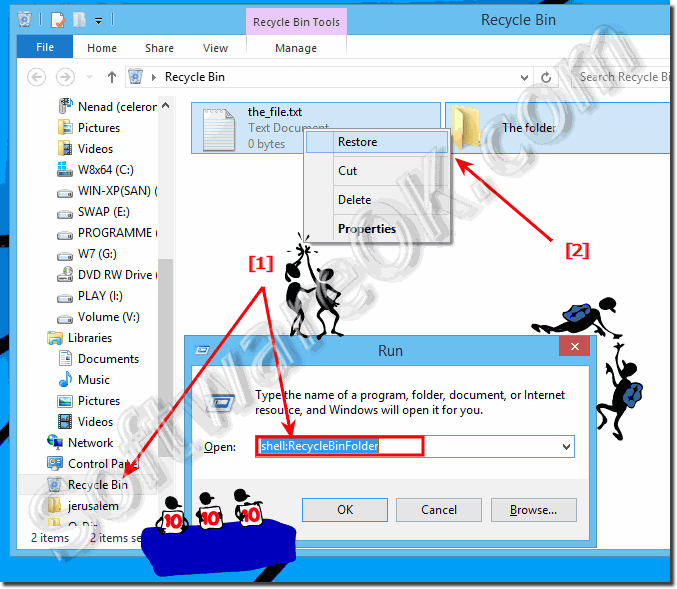 How to recover deleted files in recycle bin windows 8.1? Restore documents this pc directory windows 8.1 registry? How to restore all file and folders in windows 8.1? Reseting windows 8.1 recovering files? Windows 8.1 restore deleted files? Windows 8.1 reset recycle bin? How to restore deleted files from recycle bin using cmd on windows 8.1? Windows 8 Recovery File Location?